Ask George what he lives for though and he'd show you the cavernous holes in his backyard. The one that burst the sprinkler system. The other one that unearthed a vole. The hole so large it toppled a boxwood bush and left a mud pit in its wake. George is not a bad dog; he's a good dog and mighty pretty even when he's covered in mud. But George is an adolescent, and he gets bored easily when there's no one to play with. Maybe your dog is a lot like George. Or perhaps your dog digs for different reasons. Digging is like chewing, jumping, barking, and any other activity -- there are many reasons why dogs do what they do. a)	He likes to create cool, shallow pits to rest in. b)	He has something he likes to bury. c)	He's after a mole, insect, or other creature. e)	His dog-pal is digging, and hey--why not? Most dogs dig as pups and adolescents - it's a fun, stimulating activity. For perspective, think back on what wild things you did as an adolescent: drive fast, take risks, do drugs... At least your dog won't do any of that. 1. Never shout, hit, or use an electronic collar. Human anger doesn't make sense to dogs. Yes, we look scary and intimating, but dogs aren't human. While they may run away, they won't link your craziness to the fun they just had and might even mistake your screaming (aka barking) as entertainment. As far as vibrating/shock collars, I'm going to come right out and say it: remote trainers ruin dogs. I see it way too often. Getting shocked or vibrated in the midst of fun leads to insanity. Digging is dog play like balls, mud, and water are kids' play. Play, anger, and electricity don't mix. 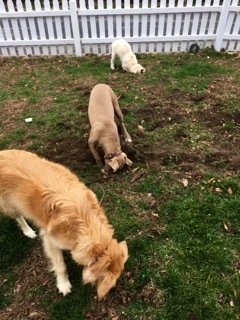 My dogs love to dig (as depicted in the 3-in-1 photo), but they also love to chew, tug, and race around. As costly as bones can be, I've found a few that last long and are quite satisfying. My dogs love puzzle toys, too. Spend a bit of time discovering your dog's other interests and capitalize on those by spending 10 minutes playing together or rewarding him with a fun new game. 3. Create a dig-fun zone. If your dog's drawn to dirt, set your sites on redirecting the fun instead of thinking you can eliminate his passion altogether. If you've got a yard, designate your dig zone as all-out-activity area by tying down favorite chews (so they can't get carried off), placing a tunnel or water tub nearby, as well as create a digging feature. Your digging attraction might encircle a tree, be a pit filled with dirt, sand and mulch, or an actual sandbox. Whatever you do to satisfy your dog's digging dreams, help him form the habit: Say "Go Dig" as you head to your new spot, bury bones, and dig together. Preparation	Since dogs detest the smell of Oregano oil, prepare a 1x1"square of bread with 20 drops of full-on oregano oil. Discretely place the pre-soaked bread somewhere your dog will find it, preferably indoors and away from other distractions. Dilute and Pour Once the smell is mapped in your dog's mind, add 10 drops (or more) to a gallon of water. Fill in one of his holes with dirt, then pour your concoction on top of it. Your home is your dog's den -- a safe place to rest and reconnect. If you notice that your dog is digging each time you leave him outside unattended, the message he may be sending is that he doesn't like being outside alone. That's understandable. Think how you'd feel if you got locked out of your home -- you'd probably be frantic, too. Fresh air is only good for dogs if you're out there, too. 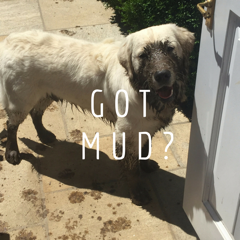 Bonus Tip: If your dog seems obsessed with digging in one location, fill the holes with his own stool or large rocks, or place a screen 3" under the top layer of dirt or grass. So --now that you better understand his reasoning-- there you have it! A new go-to plan for your delightful digger. Digging, chewing, nipping, jumping--young dogs are like young kids. It's always something!